Dr. Pnina Abir-Am, historian of science at Brandeis University’s Women’s Studies Research Center, is the first individual to complete a term as Resident Scholar in the OSU Libraries for the 2012-13 school year. 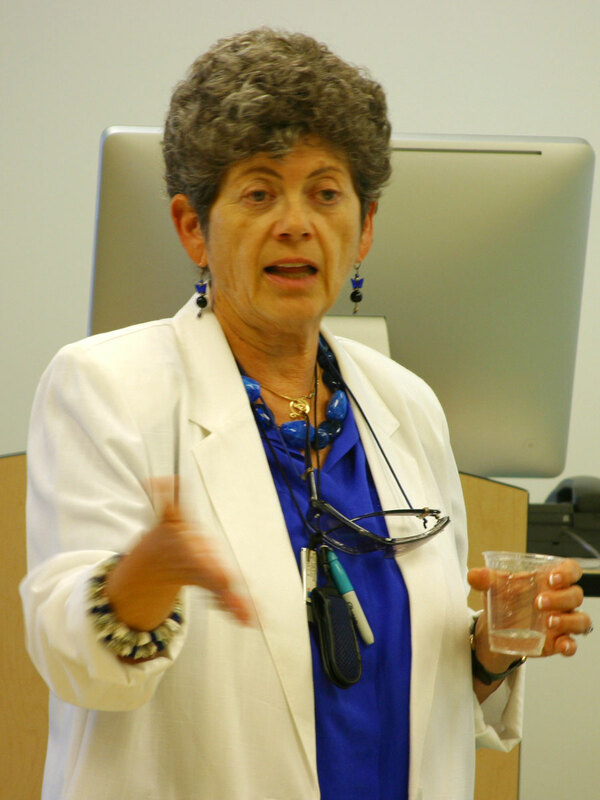 An accomplished scholar, Abir-Am has authored and edited a number of noteworthy publications, including the influential book Uneasy Careers and Intimate Lives: Women in Science, 1789-1989 (Rutgers University Press, 1987, 1989) co-edited with Dorinda Outram. In her Resident Scholar presentation, Abir-Am argued – as have many others – that Pauling was ideally positioned to solve the DNA structure, given his great successes in protein research from 1936-1951 and culminating in his elucidation of the alpha-helix. The question then, is why did he fail to discover the double helix? Why did he lose the “race” to James Watson and Francis Crick? The reasons for the failure are manifold, and Abir-Am acknowledges many that have been pointed out by other researchers. For one, Pauling was very casual in his approach, believing protein structures to be of more importance than DNA. He also underestimated the research being conducted by certain of his peers, including Erwin Chargaff, J.T. Randall and Rosalind Franklin. In particular, Abir-Am argues that Pauling disregarded the work being conducted at Kings College, London, believing that physicists like J.T. Randall and Maurice Wilkins could not be expected to solve a complex biological structure like DNA, as their training left them ill-equipped for the task. By the time Pauling did get serious about the DNA structure, he was too far behind the competition, using poor quality data and rushing a structure to print. Indeed, in the end, Pauling’s attitude toward DNA could be summed up as “too little too late,” a situation further reinforced by the political problems – culminating in the revoking of his passport – that he faced throughout 1952. Abir-Am sheds new perspective by focusing on the social structure surrounding Pauling at Caltech during the early 1950s. In examining the story from this perspective, Abir-Am wonders what “Pauling’s boys” – understudies, peers and other colleagues including Alexander Rich, Robert Corey, Eddie Hughes, Verner Schomaker, Jerry Donohue, David Harker and Pauling’s second-born son, Peter – could have done to render Pauling’s attempt at DNA more successful. Abir-Am posits that “the boys” could have done plenty: collect x-ray crystallographic data, collaborate on model building, make calculations, serve as delegates at conferences and even collect intelligence on rivals. To some extent all of this did occur, but never to the point where Pauling shied away from his manifestly wrong triple-helical structure. Pauling did not inform “the boys” of his interest in DNA because he wanted to surprise them. By the conclusion of her stay, Abir-Am was still wrestling with these questions and evaluating her conjectures. An entire chapter of her DNA book will be devoted to Pauling’s failed structure – we’ll be very excited to read it! After seeing this post, Dr. Abir-Am asked that we add some comments of her own, which are included here. My initial reaction to OSU-SCARC’s (Oregon State University, Special Collections and Archive Research Center) Paulingblog’s entry of 11-21-12, reporting on my lecture “‘Pauling’s Boys’ and the Mystery of DNA Sructure” was “Wow, they did a better job than I might have done on my own!” Indeed, OSU-SCARC’s Program for Resident Scholars is a scholar’s paradise: a spacious reading room flooded by sunlight provides a superb “room with a view” of gorgeous Oregon trees. State of the art equipment scans archival documents straight into your flash drive. Rare, as well as recent, books that scholars might need to complement one’s ongoing archival research, line the reading room’s walls forming tasteful panels. The entrance is flanked by two glass cases for archival exhibits that rotate periodically and give the foyer a museum look. But above all, SCARC is a paradise because of its angelic people, all eager to help resident scholars make the best of their precious stay. I was amazed at how readily the SCARC personnel not only guided me through the maze of archival documents in their care, but also helped me in preparing essential visuals. By displaying photomontages of Pauling and his associates, I was better able to convey his enigmatic predicament, as a leading molecular structurist who missed the solution of DNA structure, even though he was surrounded by many gifted and loyal associates, or “boys” in his era’s jargon. 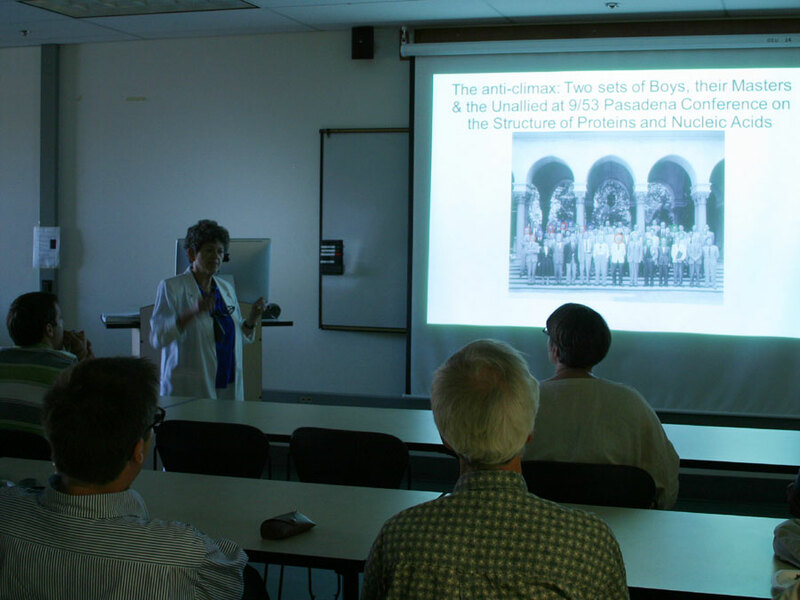 Along these lines, a slide of attendees at the Pasadena international conference on “Protein and Nucleic Acid Structure” which Pauling organized in September 1953, captured by photo 2 above, (click for enlargement) distinguished between “boys” from rival groups by color circles around their heads. These graphical devices were critical for my new argument that the outcome of competition over DNA structure was a matter of group rather than individual action. Having spent considerable time in many archives on both sides of the Atlantic ocean, I have to conclude that OSU-SCARC, situated in the remote splendor of the Pacific Northwest, provides greater scholar-friendly opportunities than anything I have seen, including my prior favorite CCAC. (Churchill College Archive Center in Cambridge, UK) I now count SCARC scholars among my cherished colleagues and consider their work to be a valuable resource for my own chapter on Pauling & Co.’s effort with DNA structure. Last but not least, SCARC’s interest in this chapter, as well as in my forthcoming book DNA at 50 proved invigorating in propelling me toward a speedier revision of both chapter and book. The Paulingblog’s Photo 2 conveys the civilized environment of OSU Libraries’ Willamette Lecture Room. For the sake of completeness, I wish to remind future applicants that the environment outside OSU’s library can also become a much cherished memory, especially the wild rapids of the McKenzie River which we survived during the Labor Day weekend preceding my 9-5-12 talk. Hopefully, the treasures I left untouched, whether in the archive or in the nearby Oregonian wild nature (e.g. Upper Klamath – I signed a petition to open it for rafting – Crater Lake, Sunset Bay) will soon cheer additional beneficiaries of SCARC’s Program for Resident Scholars. Francis Crick’s Nobel Prize medal for the discovery of the structure of DNA sold for 4 times its estimated value. A number of Francis Crick’s possessions were sold at auction this week in New York, including his Nobel Prize medal, which raked in $2.27 million. It was the first time a Nobel Prize medal was had ever been sold at auction, according to LiveScience. Auctioning began on the medal at $280,000, but within a minute or so, bidding had exceeded the $1 million mark. In the end, the winner was Jack Wang, CEO of a Chinese biomedical firm that’s working on organ regeneration and devices that claim to work by activating electromagnetic fields in the body, according to Nature. Correction (April 12): This story has been updated from its original version to correct Francis Crick’s name.The Scientist regrets the error. In NATURE, On 02 April 2013 Corrected 05 April 2013 Ewen Callaway wrote an article about Crick’s family stands to gain more than a million dollars after his Nobel medal and other memorabilia go to the auction block next week in New York. The 23-carat-gold medallion was awarded for the 1962 Nobel Prize in Physiology or Medicine, which Crick shared with Watson and Maurice Wilkins for their work on determining the molecular structure of DNA and its role in heredity. Crick put the medal in a family trust in 1990.